Photo sent in by John O'Shea. 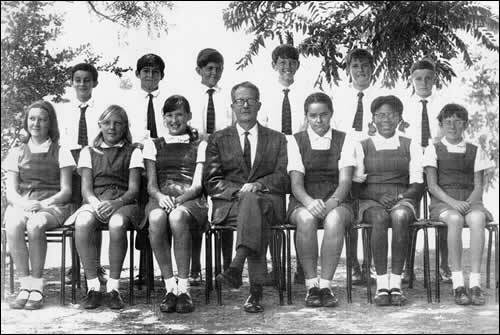 Here is a picture of the actor Richard E. Grant (3rd from right, back row) age 11 at St Mark's Primary School in Swaziland. I was in the same year but opposite class. Born Richard Esterhuizen, so I guess that's why he used the 'E' in Richard E. Grant. The headmaster in the picture is my dad Trevelyn Brockwell who incidentally taught Richard Esterhuizen's father Hennie Esterhuizen in the 1940's at Goedgegun. When this photo was taken, Hennie was Director of education in Swaziland.